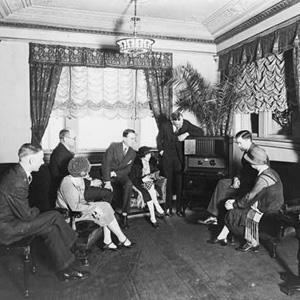 A group of people listening to the radio at the Hamilton Hotel in Washington D.C.
MARIO RITTER: Welcome to THE MAKING OF A NATION -- American history in VOA Special English. This week in our series, Kay Gallant and MAURICE JOYCE: tell about the many changes in America during the early nineteen twenties. KAY GALLANT: There was a presidential election in America in nineteen twenty. President Woodrow Wilson was not a candidate. He had suffered a stroke and was too sick. The two major candidates were Democrat James Cox and Republican Warren Harding. Voters had a clear choice between the two candidates. MAURICE JOYCE: This was a great change in the nation's thinking. For twenty years, since the beginning of the century, the United States had become more involved in international events. KAY GALLANT: Instead, Americans became more concerned with material things. During World War One, they had lived under many kinds of restrictions. The federal government had controlled railroads, shipping, and industrial production. At the end of the war, these controls were lifted. Industries that had been making war supplies began making products for a peacetime economy. MAURICE JOYCE: Technology made it possible for millions of people to improve their lives. It also caused great changes in American society. Two of the most important new technologies were automobiles and radio. KAY GALLANT: Before long, there were cars everywhere. All these cars created a need for better roads. Outside cities, most roads were made just of dirt. They were chokingly dusty in dry weather and impassably muddy in the rain. MAURICE JOYCE: Cars changed more than the way Americans traveled. They changed the way Americans lived. They removed some of the limitations of living conditions. KAY GALLANT: Cars helped Americans learn more about their nation. In the nineteen twenties, people could drive all across the land for not much money. Places that used to be days apart now seemed suddenly closer. MAURICE JOYCE: Not all the changes linked to the car were good, of course. 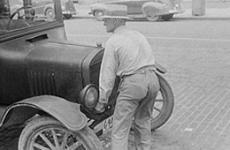 Automobile accidents became more common and deadly. Other forms of transportation, such as railroads, began to suffer from the competition. Some railroads had to close down. Horses and wagons -- once the most common form of transportation -- began to disappear from city streets. KAY GALLANT: While the automobile greatly changed America's transportation, radio greatly changed its communication. The first radio station opened in the state of Pennsylvania in nineteen-twenty. Within ten years, there were hundreds of others. There were more than thirteen million radio receivers. Most of the radio stations were owned by large broadcasting networks. These networks were able to broadcast the same program to stations all over the country. MAURICE JOYCE: Most programs were simple and entertaining. There were radio plays, comedy shows, and music programs. But there also were news reports and political events. Millions of people who never read newspapers now heard the news on radio. Citizens everywhere could hear the president's voice. KAY GALLANT: Radio also was a great help to companies. Businesses could buy time on radio programs for advertisements. In these 'ads', they told listeners about their products. They urged them to buy the products: cars. Electric refrigerators. Foods. Medicines. In this way, companies quickly and easily created a nationwide demand for their goods. MARIO RITTER: Our program was written by Frank Beardsley. The narrators were Kay Gallant and MAURICE JOYCE. You can find our series online with transcripts, MP3s, podcasts and historic images at www.unsv.com. You can also follow us on Facebook and Twitter at VOA Learning English. Join us again next week for THE MAKING OF A NATION -- an American history series in VOA Special English.